Beauty and the Beast 3D: Is it Worth Taking the Kids? When I first heard that Disney was bringing Beauty and the Beast back to the big screen, I was mildly interested. When I heard that it would be in 3D, I was very interested! Beauty and the Beast has always been a cherished Disney movie for me personally. I always related to Belle (the main female character) on some level. First off, she had brown hair and brown eyes. As a little girl growing up, I was constantly being confronted with “blonde is better” everywhere I turned. Here was a Disney Princess that looked like ME and she was considered beautiful! I also could relate to Belle’s desire to see the best in people as well as her steadfast desire to protect her loved ones at any cost. Belle was a role model I looked up to as a young girl, so I was excited to share this movie with my own children. Beauty and the Beast 3D doesn’t disappoint. It’s gorgeous, of course. I remember thinking that it was a beautiful movie way back when I first saw it in the 90’s. Now though, it’s breathtaking. The opening stained glass scene looks bright and vibrant and “Be Our Guest” as well as the other songs really make a big splash on the screen! 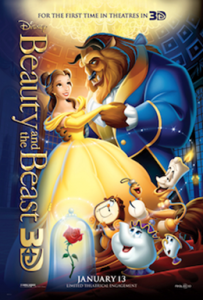 The kids had actually seen Beauty and the Beast before, since we do own the movie on DVD. However, they were riveted by the 3D version! My 4 year old son laughed so hard when the villagers stormed the castle and the transformed servants struck back! My 2 year old daughter brought her special Belle barbie doll that my MIL bought her for Christmas to the movie and enjoyed having her doll dance around as she watched the movie. My answer is yes, you should definitely take your kids to see the 3D version! It was great and fun for the whole family. We also got to see the Tangled Ever After short and it is HILARIOUS! Loved it! Beauty and the Beast 3D opens everywhere Friday January 13, 2012. Disclaimer: My family was invited to a local pre-screening of this movie in order to facilitate this review. We were not compensated for our opinion. All thoughts and opinions are our own. i totally agree! I love belle, my all time favorite princess! so much that my daughters middle name is belle. she has brains and stands for what’s right. the best part is we’ll be taking my daughter with one free admission from Disney rewards.